He will fly to Labitnangi tonight. 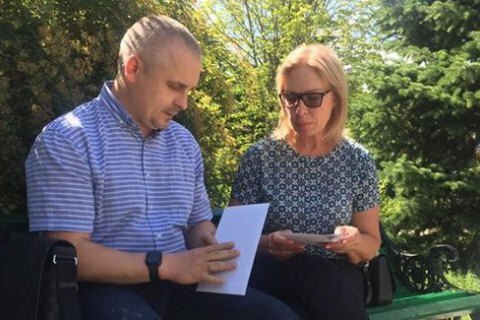 Ukrainian ombudsperson Lyudmyla Denisova has given the lawyer of Ukrainian film director Oleh Sentsov, who was convicted for terrorism in Russia, a letter from Ukrainian President Petro Poroshenko and first deputy speaker Iryna Herashchenko. Denisova said that she met Sentsov's lawyer Dmitriy Dinze who will to Labitnangi tonight to visit Sentsov in the White Bear colony. The lawyer said he saw Sentsov two weeks ago and did not know how he felt. "In his words, he was okay. He drank water, received IV drips of vitamins and glucose. He was not force-fed at the time. Currently, there is no accurate information about Oleh Sentsov's health," she said on Facebook. The lawyer promised to call Denisova after his meeting with Sentsov. Earlier today, Denisova asked the Russian ombudsperson to initiate Sentsov's pardon. Denisova has not been able to meet Ukrainian political prisoners in Russia so far.